“Whitman Illuminated: Song of Myself” Begins! Here is the first spread of the illustrated book I am producing for Tin House Books. Tentatively dubbed Whitman Illuminated: Song of Myself, I will be hand-rendering every single letter of the original 1855 edition of Whitman’s epic poem. I’m treating it as a sacred text, hand-rendering the poem line for line. I hope the final form will invoke the sensibility espoused by Whitman: his rough vigor, his earthy frankness, his dreamy expansiveness, and his reverence for life in all its forms. 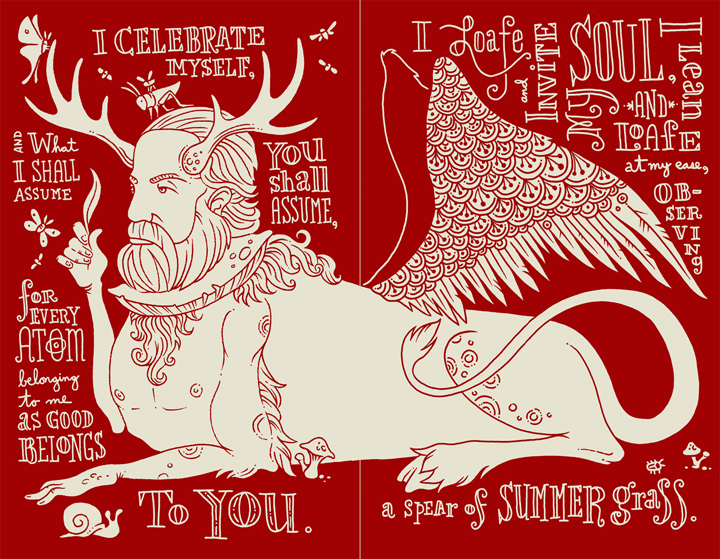 The final form of Whitman Illuminated will be hardcover, about 5 x 7.75 inches in size. The book will likely weigh in at around 256 pages. The paper stock will be rough and textured, and only three Pantone colors will be used in the interior. I feel very good about how it has progressed so far, and I’m excited to see the book in its final form. Tentative release date is sometime in the spring of 2014, but that might prove to be sooner as the schedule tightens up as the project moves along. More on that later. I will be posting new pages here regularly; updates will also be posted on the Tin House Tumblr site, too. I will be posting favorites of mine as I go, but you’ll have to buy the final book to see it in its entirety. By my estimation, I must average at least one page per day between now (June 30, 2012) and April 1, 2013 in order to complete the book on time. No small feat, but as an old graphics warhorse I’ve completed more daunting projects. I ain’t a-feared. There will be new art, posts about the process and the materials, and even a video or two. So keep checking in over the weeks to come! This entry was posted in Whitman Illuminated on June 29, 2012 by Allen Crawford. Allen is excited to finally share this more hand-rendered side of his work! Allen has just signed on with Tin House to illustrate the 1855 edition of Walt Whitman’s epic poem, “Song of Myself.” This ambitious project, which will consist of hundreds of illustrated pages, is scheduled to be released in the spring of 2014. This entry was posted in Whitman Illuminated on June 3, 2012 by Allen Crawford.